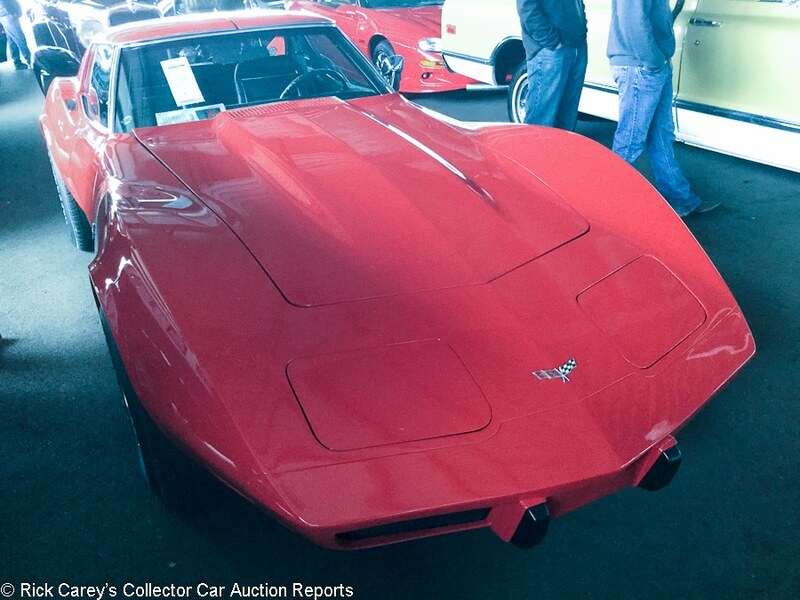 This is RM Auctions first Spring Auburn after absorbing Auctions America. Note, though, that it is “RM Auctions”, not RM Sotheby’s, continuing the market positioning that distinguished RM Sotheby’s catalog auctions from the consignment sales of RM Auctions formerly Auctions America. 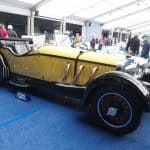 As mentioned two months ago after the first newly-named RM Auctions sale at Ft. Lauderdale, there has been some venue-swapping as well with RM Auctions taking on the fall Hershey sale giving it a four-auction annual calendar, Ft. Lauderdale, Spring and Fall Auburn and Hershey. The upcoming sale of Michael Dingman’s collection will be under the RM Auctions banner also. 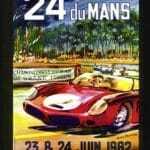 RM Sotheby’s auction venues include Arizona, Amelia Island, Paris, the newest venue at Techno-Classica Essen in April, Monaco/Villa d’Este (in alternate years), Monterey and London. The all-Porsche auction at the Porsche Experience Center in Atlanta will be an RM Sotheby’s event, also. The 2018 numbers below are preliminary. Taken from RM’s post-sale press release totals, they are a surrogate for the full results which haven’t been received from RM, even a month after the auction. 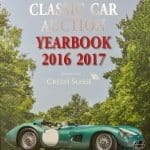 The low average sale and large number of lots reported relative to prior years suggests the press release numbers may include automobilia. Rob Bennett and Reggie Horning were on-site and provided the observations that form the basis for the descriptions that follow. The final copy and comments have been edited by me and the entire content is my responsibility. The cars reported are sorted by Marque, Model, Body Style and Year. 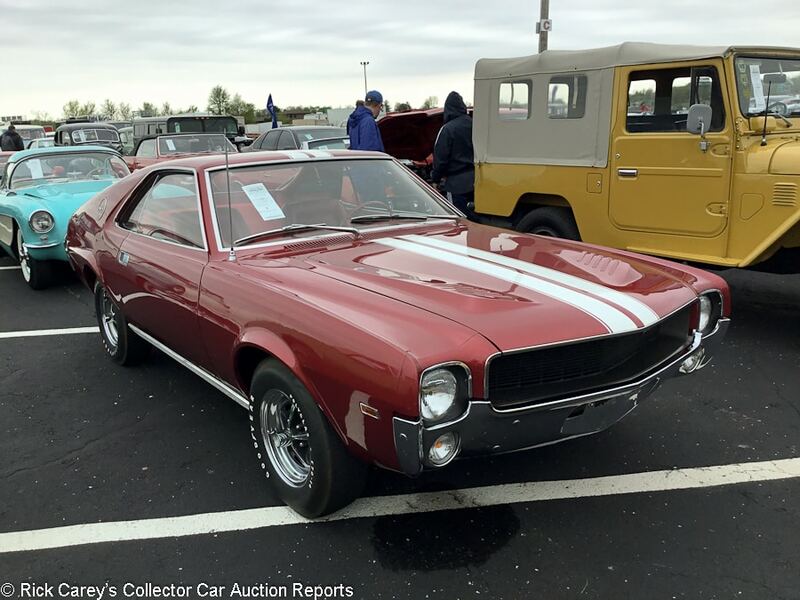 Lot # 3112 1968 American Motors AMX Fastback; S/N A8M397T257154; Red, White stripes/Red vinyl; Estimate $25,000 – $28,000; Enthusiast restoration, 3 condition; With Reserve; Hammered Sold at $20,500 plus commission of 10.00%; Final Price $22,550. – 343/280hp, 4-speed, Polyglas tires, bucket seats, floor shift, Kenwood CD stereo, Go Package. – Good professionally applied paint. Straight bodywork. The underbody is lightly restored with light undercoating, new exhaust and recent front suspension bits. The interior has new upholstery and carpet but original door panels. A solid, lightly restored driver. – AMXs are still a great value in the world of classic two seaters, and this was a fair number for a basic 343-powered car. 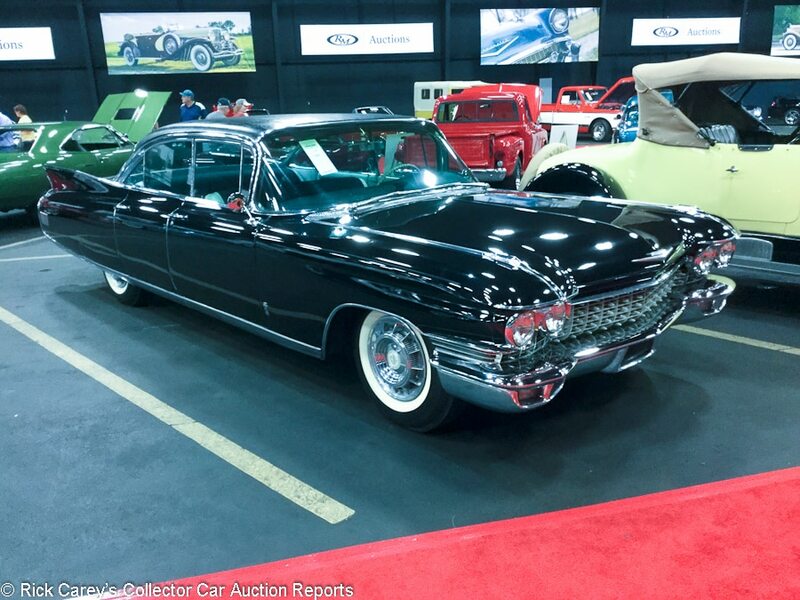 Lot # 5082 1960 Cadillac Fleetwood 60 Special 4-Dr. Hardtop; S/N 60M010460; York Blue/White leather, Blue cloth; Estimate $28,000 – $38,000; Older restoration, 3- condition; With Reserve; Not sold at Hammer bid of $23,000. – Autronic Eye, clock and radio, power steering, power windows, power seat, power antenna, wide whitewall tires, new aluminized exhaust system, vinyl roof, skirts – The paint has too many scratches and chips to count. Rubber seals are starting to show wear. The interior surprisingly shows very little wear and is in good condition. The windshield has a smoky appearance with a large amount of scratches. The vinyl roof is good and shows no fading. The engine is clean and detailed, but the exhaust manifolds show quite a bit of heat rash. The underbody is clean with signs of some undercoating in the past. It shows a good amount of wear with some oxidation along the passenger side. This car has plenty of needs, and deserves to have them addressed, but is reassuringly preserved. 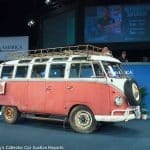 – Mecum just sold a Fleetwood 60 Special for over $100,000, but that was a gorgeous former show car and a ’59 model, which is slightly more valuable. This one is a serious contrast, and with its acres of sheetmetal to paint, not to mention plenty of other little flaws, it could have sold at the reported high bid without only twinges of regret. 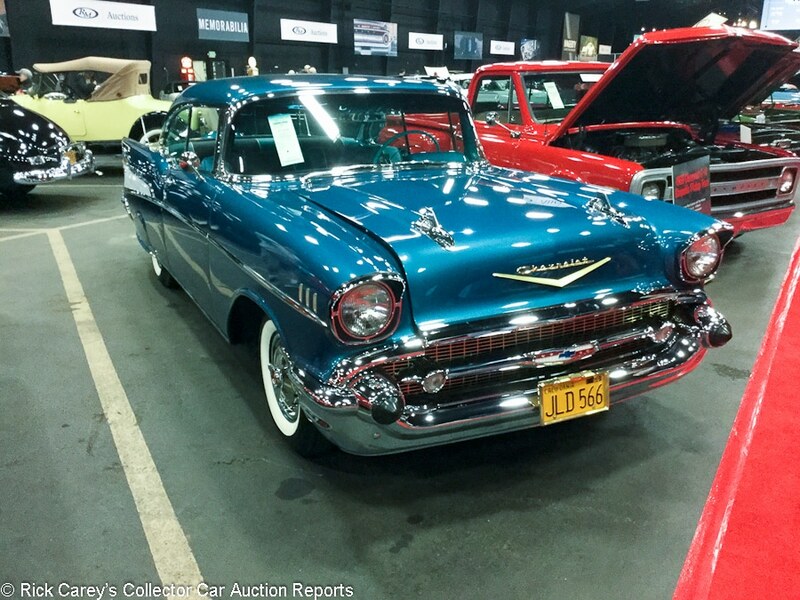 Lot # 5039 1957 Chevrolet Bel Air 2-Dr. Hardtop; S/N VC570163461; Tropical Turquoise, India Ivory/Blue vinyl, Black cloth; Estimate $50,000 – $60,000; Recent restoration, 2 condition; With Reserve; Hammered Sold at $53,500 plus commission of 10.00%; Final Price $58,850. – 286/270hp dual quads, 3-speed, restoration documents and factory tool kit included, fender skirts, wide whitewall tires with centerlock wheels, Continental kit, dual rear antennas. – The hood shows some detailing scratches but no other flaws were found. The chrome is fresh and bright and the rubber seals are all new. The interior is all new. The engine compartment has been restored and appears to be correct. There is a new Interstate battery as well. The underbody was not missed in the restoration as it is very clean and shows no wear. A very good Tri-Five Chevy that has been very thoroughly restored without going over the top. – This car just sold for $50,000 hammer, $56,000 all-in at RM Sotheby’s Arizona back in January. 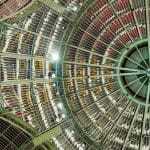 Consistency at auction is a good indicator of value, and both numbers are appropriate. 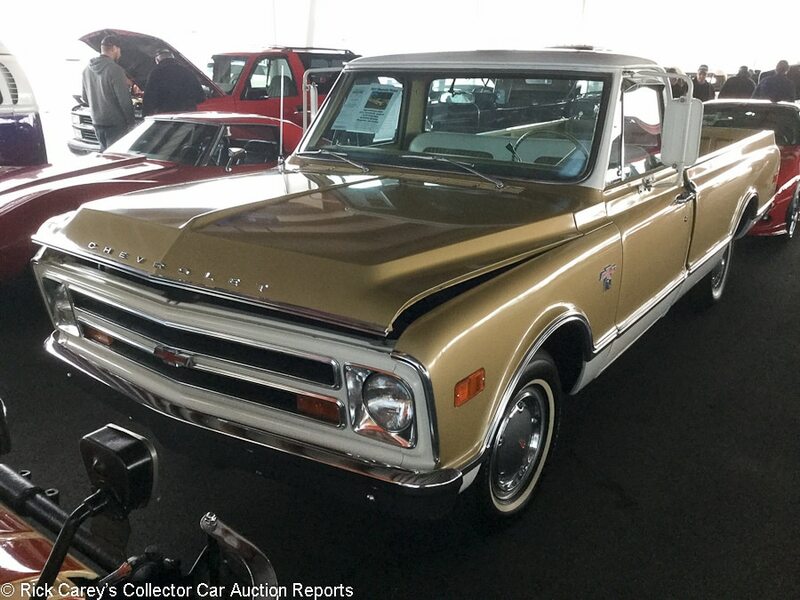 Lot # 5027 1968 Chevrolet C10 1/2 Ton Stepside Long Bed; S/N CE148F133264; Gold, White/White, Gold vinyl; Estimate $20,000 – $25,000; Visually maintained, largely original, 2+ condition; With Reserve; Not sold at Hammer bid of $19,000. – 327/240hp, automatic, wheel covers, narrow whitewalls, dual mirrors, column shift, factory radio. – Older repaint with minor scratches here and there. Straight body. The interior appears original other than new carpet and dash pad. The underbody is original but detailed with no undercoating. The engine bay is all original and unrestored but maintained. A well-kept old C10 but hasn’t gotten the expensive restoration work that others have gotten in recent years. – While this is a good old truck, it’s no better than the bid for it here and it could have been sold without regret if there was money at this level. 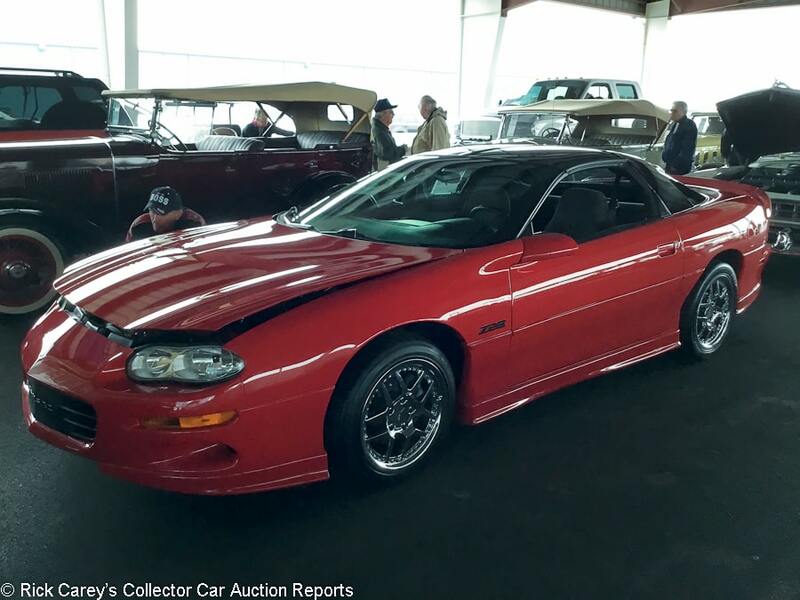 Lot # 5029 2002 Chevrolet Camaro Z/28 Coupe; S/N 2G1F822G122156568; Bright Rally Red/Gray cloth; Estimate $13,000 – $17,000; Unrestored original, 3+ condition; With Reserve; Hammered Sold at $12,000 plus commission of 10.00%; Final Price $13,200. – 346/310hp, automatic, glass T-tops, power driver’s seat, cassette stereo, aftermarket wheels. – The original paint is well maintained with no obvious flaws or chips. The interior is clean, well maintained and detailed. The underbody is clean and in original condition with aftermarket cat back exhaust. The engine bay is clean and well detailed. Showing 30,876 believable miles and well-kept since new. – Fourth gen Camaros haven’t been quite as hot as their Firebird cousins, but good examples have started to catch on a bit. This is a slightly better than average example, and with the aftermarket bits and automatic transmission, it was lucky to get this much. 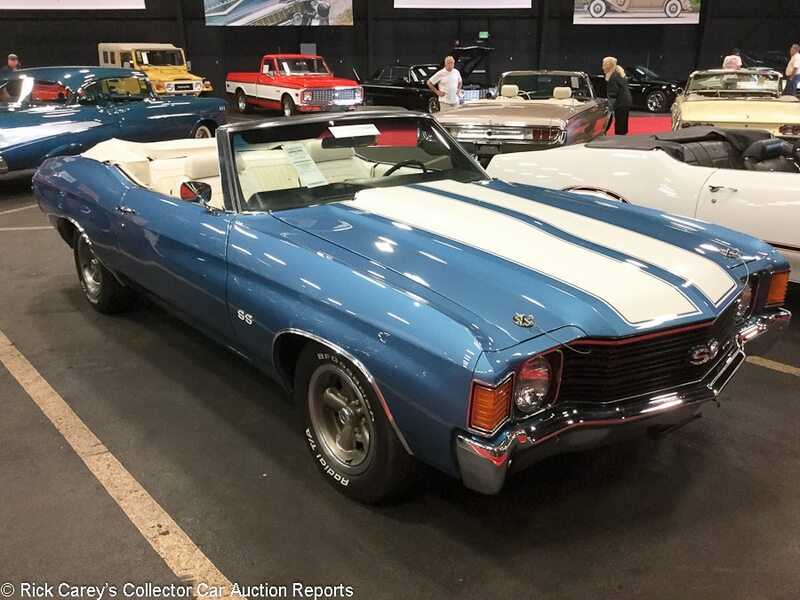 Lot # 5079 1972 Chevrolet Chevelle Malibu SS Convertible; S/N 1D67F2K64171412; Engine # 12K641714; Mediterranean Blue, Antique White stripes/White vinyl; White top; Estimate $40,000 – $45,000; Enthusiast restoration, 2- condition; With Reserve; Hammered Sold at $34,000 plus commission of 10.00%; Final Price $37,400. – Factory air conditioning, power convertible top, bucket seats, power windows, power steering, power brakes, horseshoe shifter. – The paint shows several chips on the hood that were painted over. There are two small chips in the paint on the trunk. Even with these flaws, the paint has a good luster. All seats show moderate wear and the carpet has mild wear. The engine compartment is clean and nicely detailed. The underbody is clean with very few signs of wear. This is a good car for someone who isn’t interested in a show winner or a tire-burner but something fun for casual top-down cruising. – Reported not sold at a $34,000 high bid on the block, but the seller decided to let go even at this bargain number, perhaps because the VIN is coded for a 307/130hp 2-barrel but the car is presented as having a 350 with a 4-barrel, not that such a distinction is terribly important in this case. 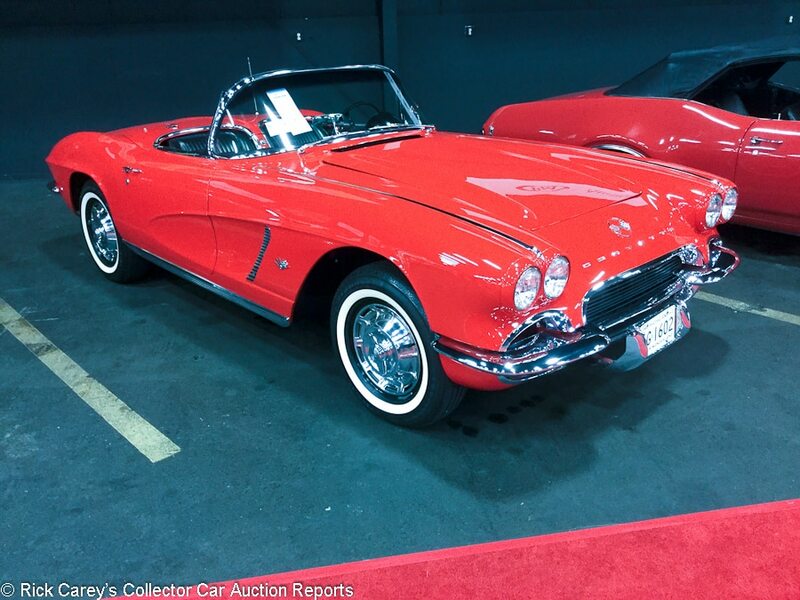 Lot # 3110 1962 Chevrolet Corvette Convertible; S/N 20867S111084; Roman Red/Black vinyl; Estimate $55,000 – $65,000; Cosmetic restoration, 3- condition; With Reserve; Hammered Sold at $52,500 plus commission of 10.00%; Final Price $57,750. – 327/250hp, 4-speed, aftermarket radio, narrow whitewalls with spinner wheel covers. – Good paint, chrome, top, glass and interior. The engine compartment looks good on top but the engine number is nonexistent and the compartment itself has been squirted with chassis black from the top leaving road gunk on lower surfaces. The chassis was painted assembled, including painting the whole exhaust system. A marginal driver. – Sold here last year for $59,400 and again for a similarly fair number given that this is a rather nasty driver with a base engine. Lot # 5019 1975 Chevrolet Corvette Coupe; S/N 1Z37J5S435404; Red/Black vinyl; Estimate $16,000 – $22,000; Visually maintained, largely original, 3- condition; With Reserve; Hammered Sold at $11,500 plus commission of 10.00%; Final Price $12,650. – 350/165hp, automatic, Rally wheels, Firehawk tires, Edelbrock intake manifold, headers, updated ignition. – Professional paint that is well applied and finished. New weather stripping. The interior appears original other than new carpet. The underbody has new exhaust and new brake lines. The A/C compressor is missing. A basic driver that’s had some expedient repairs over the years. – Basic Corvette, basic price. 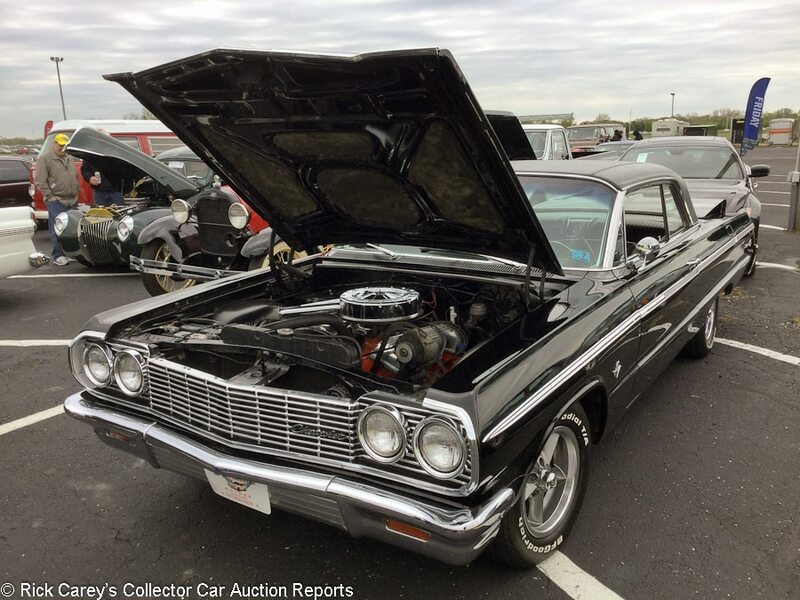 Lot # 3056 1964 Chevrolet Impala SS 2-Dr. Hardtop; S/N 41447L162587; Tuxedo Black/Black vinyl; Estimate $35,000 – $40,000; Older restoration, 3+ condition; With Reserve; Hammered Sold at $27,250 plus commission of 10.00%; Final Price $29,975. – 409/340hp, 4-speed, power steering, bucket seats, console, radio, Radial T/A tires. – The paint has a large scratch on the front left fender and a chip on the hood. The interior shows moderate wear with no fading in the carpet. The engine is clean and detailed with heavy heat rash on the exhaust manifold. Hoses have been replaced. The underbody shows some dirt with moderate wear. While nothing special stands out, it’s solid and will make for a decent driver. – Sold here four years ago for $37,400 and even though this result is significantly less it is appropriate for this car’s equipment and condition. 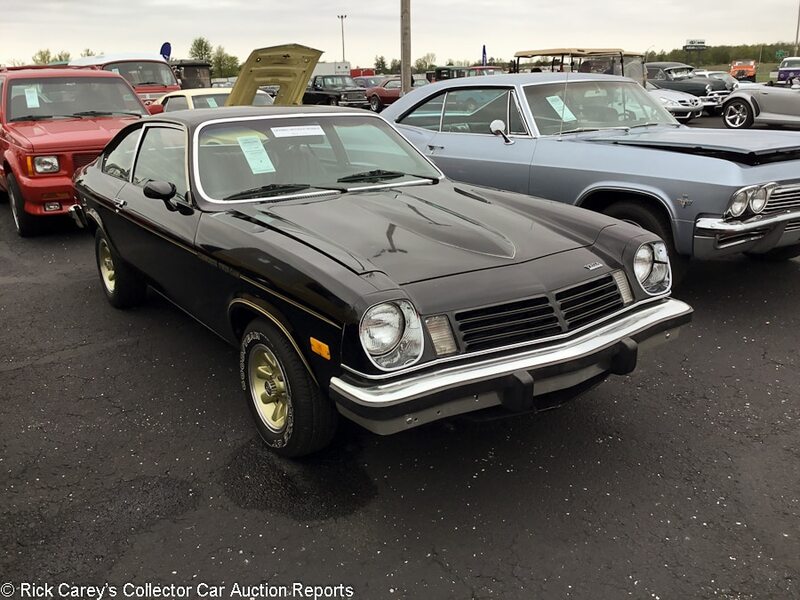 Lot # 3092 1975 Chevrolet Vega Cosworth Hatchback Coupe; S/N 1V77E5U258546; Black, Gold/Black vinyl; Estimate $6,000 – $10,000; Visually maintained, largely original, 3- condition; With Reserve; Hammered Sold at $5,100 plus commission of 10.00%; Final Price $5,610. – Delco radio, Eagle GT tires. – Appears to be original paint with new pinstripes. Chips and minor wear throughout. The interior is original with faded carpet and a small tear in the driver’s seat. The engine bay is original and well maintained but unrestored. The underbody is unrestored with new exhaust and shocks. No rust visible. A reasonably well kept, mostly original Cosworth Vega. – This is an appropriate result for an unusual and technically advanced little car that needs some work but at this price can afford to have it. It isn’t necessary to spend a lot to own a distinctive collector car. 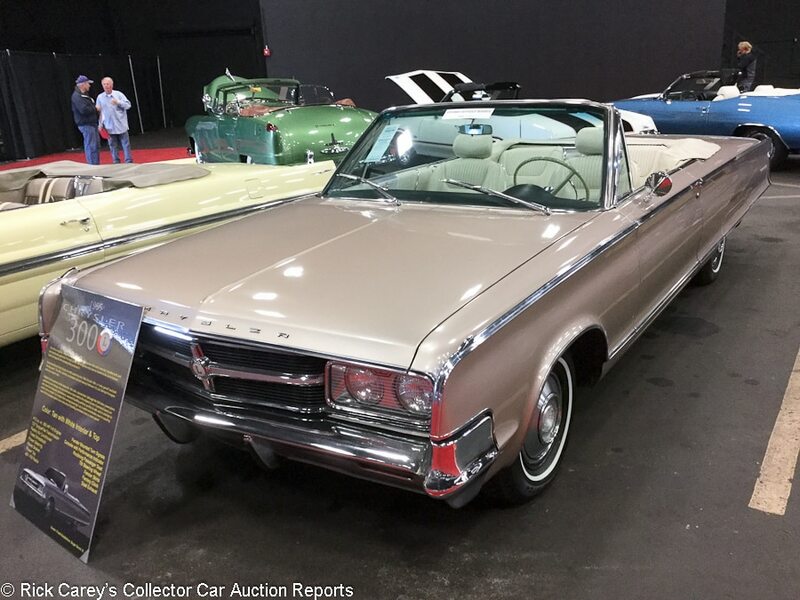 Lot # 5035 1965 Chrysler 300L Convertible; S/N C453295500; Regal Gold Metallic/White vinyl; White top; Estimate $25,000 – $35,000; Older restoration, 3- condition; With Reserve; Hammered Sold at $22,000 plus commission of 10.00%; Final Price $24,200. – 413/360hp, automatic, air conditioning, power bucket seats, power windows, power steering, power brakes, console, clock and radio. – There are a number of paint chips all around and an inch-long gouge just to the rear of the passenger’s door. The seats are dirty, worn and cracked but have no tears. The carpet shows mild wear. The engine is clean and detailed with heat rash on the exhaust manifold. The front wheel wells appear to have had undercoating in the past which now has flaked off. The underbody shows old dirt and moderate wear. There are signs of oxidation along the passenger’s side. With cleaned up or new seats, this rare 300L convertible would be a lot better, but more thorough restoration work would go a very long way. – This is probably a pretty good example of the market value of this 300, especially since it was bid to exactly the same price at Mecum Indy a week later. 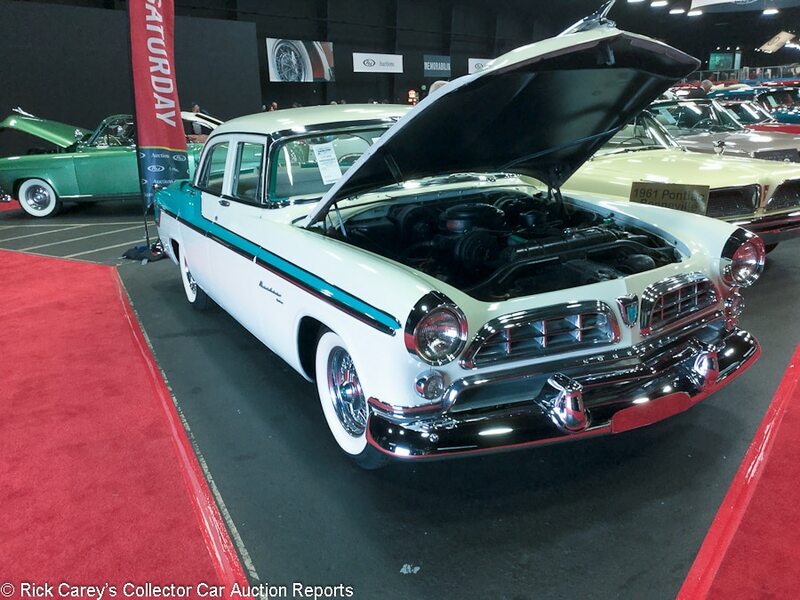 Lot # 5030 1955 Chrysler Windsor DeLuxe 4-Dr. Sedan; S/N W5573927; Platinum, Porcelain Green/White vinyl, Blue pattern cloth; Estimate $20,000 – $30,000; Visually maintained, largely original, 3 condition; With Reserve; Hammered Sold at $14,500 plus commission of 10.00%; Final Price $15,950. – 301/188hp, automatic, air conditioning, power seat, power windows, power steering, power brakes, wire wheels with whitewalls. – The paint is dull and fading. Rubber seals are hard and cracked. The chrome trim parts are starting to dull, reverse light chrome is pitted. The seats are worn and fading but the carpet shows very little wear. The engine is clean with new radiator hoses. The underbody is dirty with moderate wear. Mostly original and a bit tired, but fresh cosmetics would go a long way. – This car sold at Auburn Fall in 2015 for $26,950 and looking at it here it’s hard to imagine how it could have brought so much. It’s old and tired and brought what it deserved today. 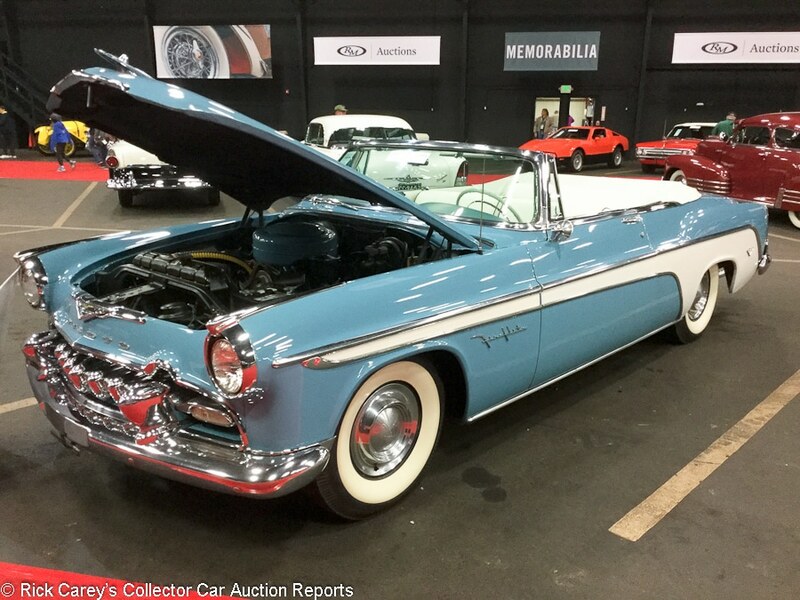 Lot # 5046 1955 DeSoto Fireflite Convertible; S/N 50353457; Dolphin Blue, Surf White/White, Blue; White top; Estimate $30,000 – $40,000; Older restoration, 3+ condition; With Reserve; Hammered Sold at $40,000 plus commission of 10.00%; Final Price $44,000. – 291/200hp, automatic, power steering and brakes, wheel covers, whitewalls, clock and radio. – The paint shows a stone chip on the front of the hood and one on the passenger door. The rubber seals are in good condition. The interior shows moderate wear on the seats and on the carpet. The engine is clean and detailed with the hoses having been replaced. The underbody is clean with mild wear. A good looking older restored Fireflite that would get attention at any local show, but isn’t a stunner. – A sound and usable car in attractive colors with distinctive 50’s Chrysler design and a sound value at this price. 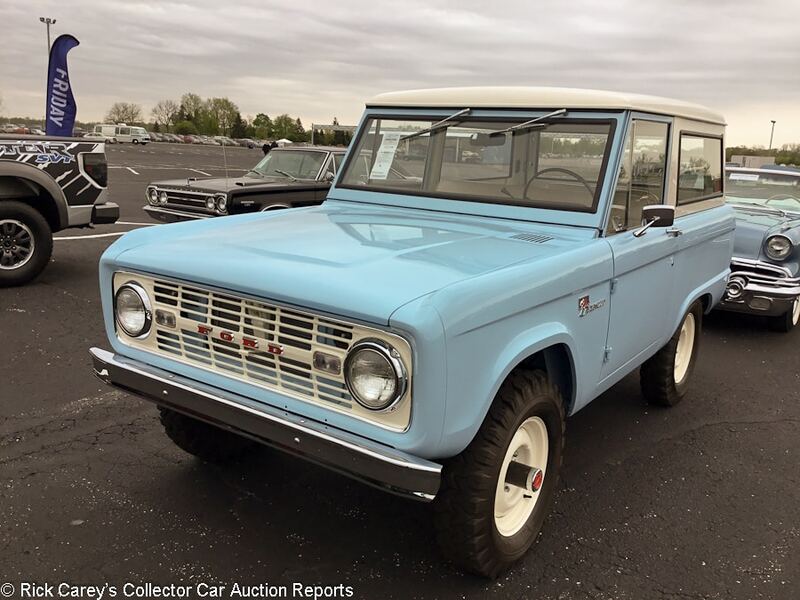 Lot # 3108 1968 Ford Bronco Wagon 4×4; S/N U15NLC84878; Light Blue, White/White vinyl; Estimate $40,000 – $50,000; Recent restoration, 2+ condition; With Reserve; Hammered Sold at $39,000 plus commission of 10.00%; Final Price $42,900. – 289/200hp, 3-speed, steel wheels, floor shift, pushbutton radio. – New professional paint. Excellent body work. New chrome and stainless. Fully restored interior. Rebuilt factory V-8 and detailed underbody. Fresh and gorgeous. – Given that first gen Broncos have started to get valuable, people are putting serious money into restoring them. This one could have brought more money given how fresh it is, but it would have been an outrageous price only a couple of years ago. 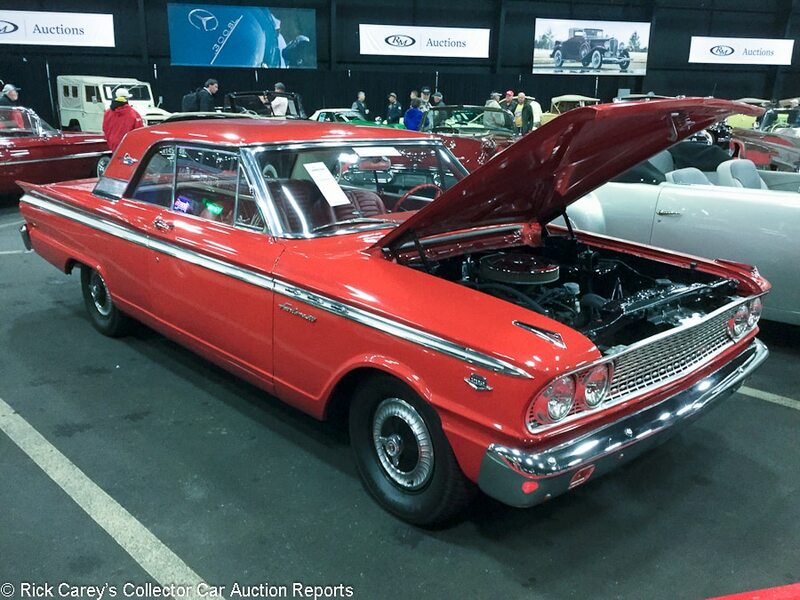 Lot # 5106 1963 Ford Fairlane 500 2-Dr. Hardtop; S/N 3K47K162423; Rangoon Red/Red; Estimate $30,000 – $40,000; Older restoration, 2- condition; With Reserve; Hammered Sold at $23,000 plus commission of 10.00%; Final Price $25,300. – 289/271hp K-Code engine, column shift 3-speed, column-mounted Sunpro tach, pushbutton radio, bucket seats and console, owner’s manual and copy of the 1963 title, Kenda radial tires with centerlock wheels. – The paint shows detailing scratches all over. There are large amounts of paint touch ups on both the right and left tails. The chrome is worn but has no pitting. The rubber seals are in good condition. The interior shows very little wear. The engine is clean and detailed. The underbody is clean but shows moderate wear. It’s easy to overlook the few cosmetic flaws for the experience of owning a rare K-Code, stick shift Fairlane and a decent driver. – The drivetrain is the key to value here and it is hardly recognized in this result. At Cars ‘n’ Coffee people are going to look inside, spot the three-on-the-tree, expect a six under the hood, then be pleasantly surprised by the K-Code V8 under the hood. Not to mention how surprised they’ll be at a stoplight. This is a good value in an obscure Ford. 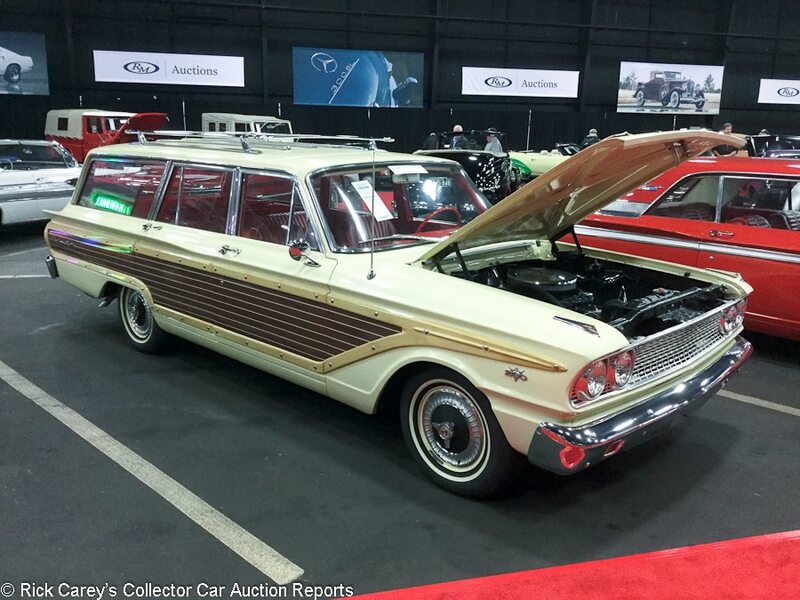 Lot # 5107 1963 Ford Fairlane 500 Squire 4-Dr. Station Wagon; S/N 3R49F177765; Tucson Yellow, Woodgrain panels/Red; Estimate $20,000 – $30,000; Cosmetic restoration, 3+ condition; With Reserve; Hammered Sold at $27,000 plus commission of 10.00%; Final Price $29,700. – 260/164hp, 4-speed, owner’s manual and documentation, Mastercraft A/S IV radial whitewall tires, bucket seats, console, factory radio, pushbutton radio, 3-row seating, roof rack. – The paint is starting to dull and has little luster and is cracked on the rear left pillar. It also has some spiderwebbing on both sides of the rear. The interior shows little wear. The engine compartment is detailed and clean. This underbody is clean with mild wear. The gas tank appears to have been replaced. This would make for a great family car or even better a tow car for a vintage racer and its condition is not so pristine that it can’t find practical use. – The bidders recognized this rare 4-speed Squire for the unusual vehicle that it is and bid it to a healthy price, solely on account of the 4-speed. It’s a triple-duty truckster, as admired dropping kids off for soccer practice as it is towing a Formula Junior or loaded up with project supplies at Home Depot. It might appear expensive, but it isn’t. 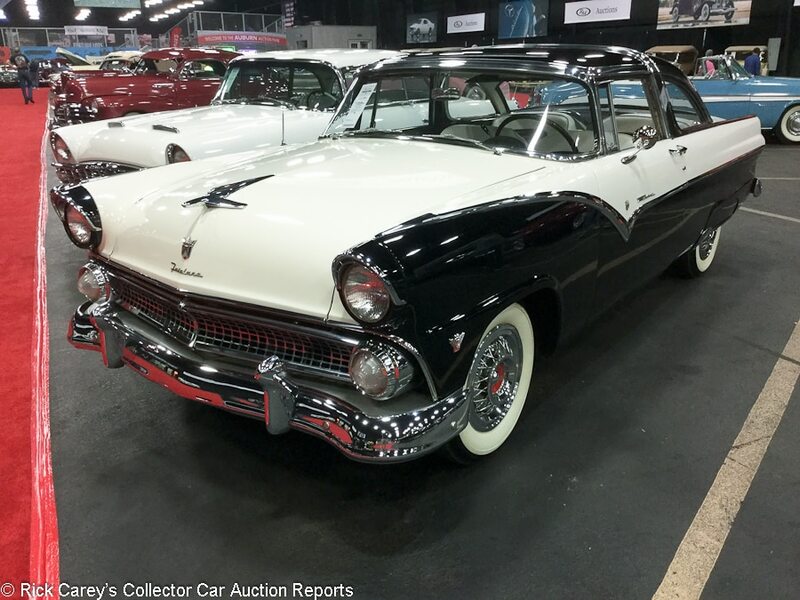 Lot # 5083 1955 Ford Fairlane Crown Victoria Transparent Top Coupe; S/N U5RW135568; Black, Snow Shoe White/White, Black; Estimate $30,000 – $36,000; Visually maintained, largely original, 3- condition; With Reserve; Not sold at Hammer bid of $24,000. – 272/162hp, automatic, two-tone interior, wide whitewall tires, wire wheel covers and fender skirts, radio, vinyl-wrapped steering wheel rim. – The paint is bubbled in several areas on the driver’s door and on the trunk as well. Rubber seals are worn and cracked. The interior shows moderate wear, and the headliner is dirty. The upper area just behind the driver’s door is starting to rust as the rubber seal is missing. The engine is dirty. The underside of the hood shows paint cracked and missing. The underbody is clean with moderate amount of wear. This is a solid vehicle but careful inspection reveals lots of issues. – The reported high bid here is reasonable and appropriate for this Crown Vic’s specification and appearance and was unwisely declined. 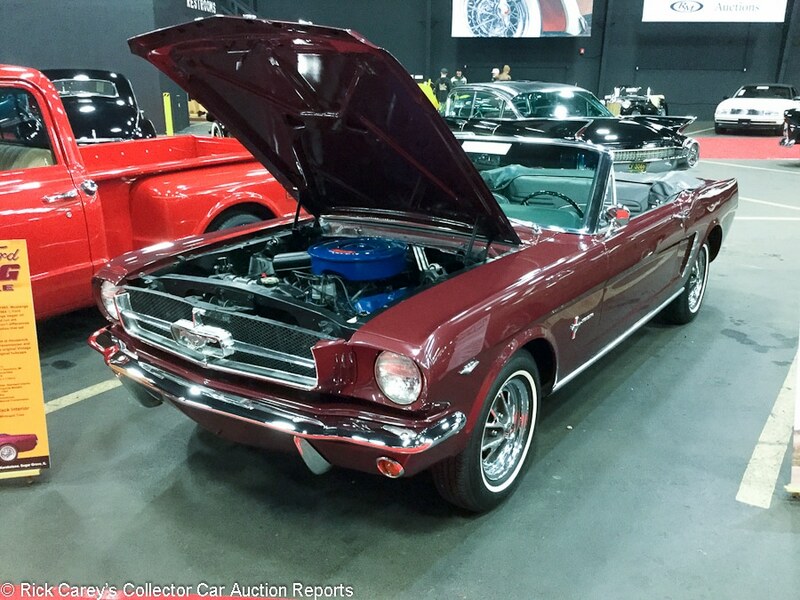 Lot # 5042 1965 Ford Mustang Convertible; S/N 5F08F175413; Vintage Burgundy/Black vinyl; Black top; Estimate $20,000 – $30,000; Enthusiast restoration, 2 condition; With Reserve; Hammered Sold at $20,500 plus commission of 10.00%; Final Price $22,550. – 260/164hp, 3-speed, AM Radio, bucket seats, Firestone narrow whitewalls, bucket seats, boot cover. – The paint shows scratches from detailing around the vehicle but it still has a nice luster. The rubber seals are in good condition. The chrome trim shows some scratches with some pitting around the tail lights. The seats have been redone, but the carpet shows moderate wear. The engine is correct, clean and detailed. Hoses and spark plug wires have all been replaced. The exhaust manifolds show quite a bit of heat rash. The underbody shows dirt with moderate wear. The gas tank has been replaced. An early 260-powered Mustang that isn’t perfect but would make for a good starter classic. – And it’s hard to argue with this price, which is starter classic money and something of a bargain considering this car’s equipment and mostly solid condition. Lot # 5072 1951 Frazer Manhattan Convertible Sedan; S/N F516B001050; Garden Green/Brown leather; Black top; Estimate $60,000 – $80,000; Older restoration, 2- condition; With Reserve; Hammered Sold at $50,000 plus commission of 10.00%; Final Price $55,000. – 226/115hp, automatic, wheel covers, whitewalls, amber fog lights, dual spotlights, boot cover, column shift, pushbutton radio. – There are three spots of bubbles in the paint on the front left fender. The rubber seals have been replaced. Interior shows heavy seat wear for the driver’s side. The front passenger’s side has mild wear and the rear seat shows little wear. The carpet wear matches the seat wear. There is paint missing on the engine and there is heat rash on exhaust manifolds. There is water dripping from the exhaust pipe. There are two spots on the passenger’s side underbody showing possible body work, but it is otherwise clean with mild wear. Even with its cosmetic flaws, this would get a lot of attention at any local show since it’s a very rare car with desirable equipment. – This Frazer Manhattan Convertible Sedan will never go unnoticed at a car show, it’s that unusual, and its condition, while having many shortcomings, is presentable. After going unsold at Auburn Fall in 2015 on a $41,000 bid and at Santa Monica in 2016 where it was bid to $50,000, it brought a reasonable price here at Auburn Spring. 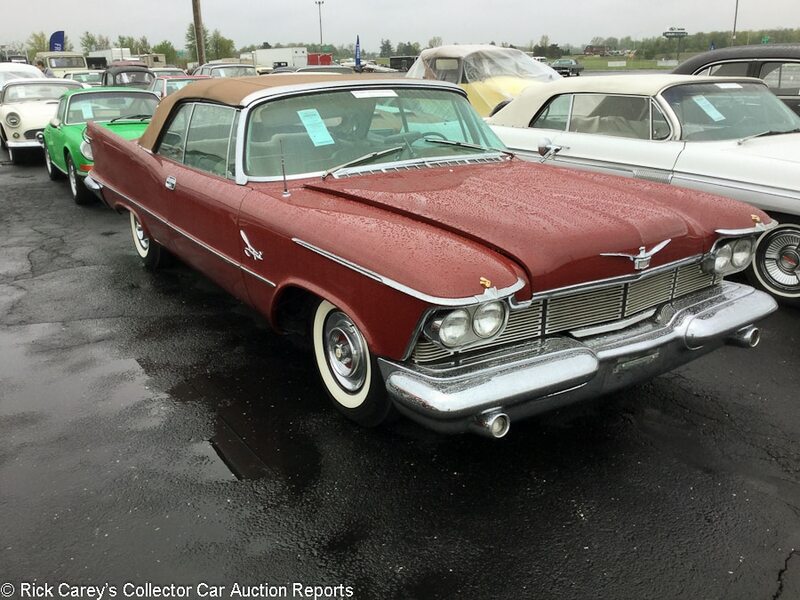 Lot # 5053 1958 Imperial Imperial Crown Convertible; S/N LY115166; Matador Red/Tan leather; Tan top; Estimate $50,000 – $70,000; Visually maintained, largely original, 3 condition; With Reserve; Hammered Sold at $33,000 plus commission of 10.00%; Final Price $36,300. – 392/345hp, pushbutton automatic transmission, power windows, wide whitewall tires, wheel covers, pushbutton radio. – The paint shows scratches on the hood and both front fenders. There is a large scratch just to the rear of the driver’s door. The interior shows very little wear but the seats use a material that gives the appearance of being wrinkled. The engine is clean and detailed. The insulation on the underside of the hood is in good condition. The underbody shows dirt and moderate wear. The wheel wells have numerous spots of paint missing. The right side of the underbody shows signs of possible body work and there are a few spots of early oxidation. This car has a lot of presence, but there are too many little things that reveal themselves up close for it to be a great car. 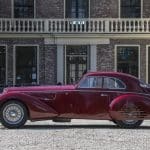 – This luxury Imperial was offered by Auctions America at Santa Monica in 2016 where it was reported bid to $57,500, a much more appropriate indicator of the value of its luxury, exclusivity and condition than the bargain price it brought here. This is a steal. Lot # 5070 1987 Mercedes-Benz 560SL Roadster; S/N WDBBA48D0HA060773; Signal Red/Black; Black top; Estimate $37,500 – $42,000; Unrestored original, 3+ condition; With Reserve; Not sold at Hammer bid of $31,000. – Automatic, power windows, steering and brakes. – The paint shows scratches from detailing all over. The hood has four very noticeable stone chips. The front and rear bumpers are heavily scratched. Some of the rubber seals are hard and cracked. The interior shows mild wear. The engine is clean but the exhaust manifold shows heat rash. The underbody shows some dirt and moderate wear. A good unrestored driver showing 35,555 believable miles, but far from perfect. – The mileage on this 560SL is impressively low and it’s a better example than many of the ones still on the road, but that doesn’t mean it’s like-new. Why the reported high bid was refused, then, is a mystery, especially since prices for R107 Benzes have retreated over the past year or so. Lot # 5076 1970 Oldsmobile Cutlass Supreme Convertible; S/N 342670M305417; Porcelain White, Pace Car stripes/Black vinyl; White top; Estimate $40,000 – $60,000; Older restoration, 2 condition; With Reserve; Hammered Sold at $30,000 plus commission of 10.00%; Final Price $33,000. – 350/250hp, Hurst dual-gate automatic, air conditioning, power steering and brakes, bucket seats, console and both original and an after-market radio. – The paint shows minor scratches from detailing on the hood and trunk. Pace car stripes align correctly. The interior shows very little wear. The engine compartment is very clean and well detailed. The underbody is clean with very little wear. A solid older restoration and as a pace car, this should garner some attention. 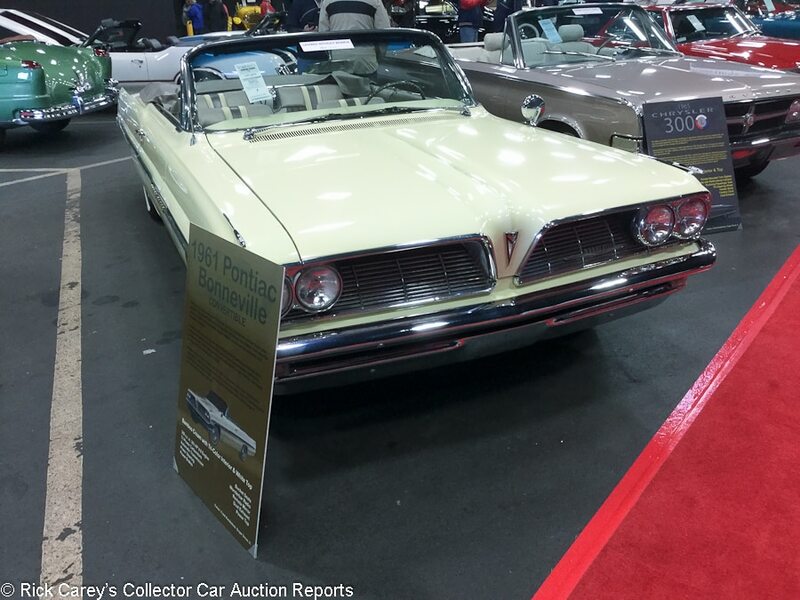 – This is an eminently collectible, practical and usable Cutlass convertible in distinctive Pace Car livery and it brought an eminently reasonable price that’s fair to both the buyer and the seller. 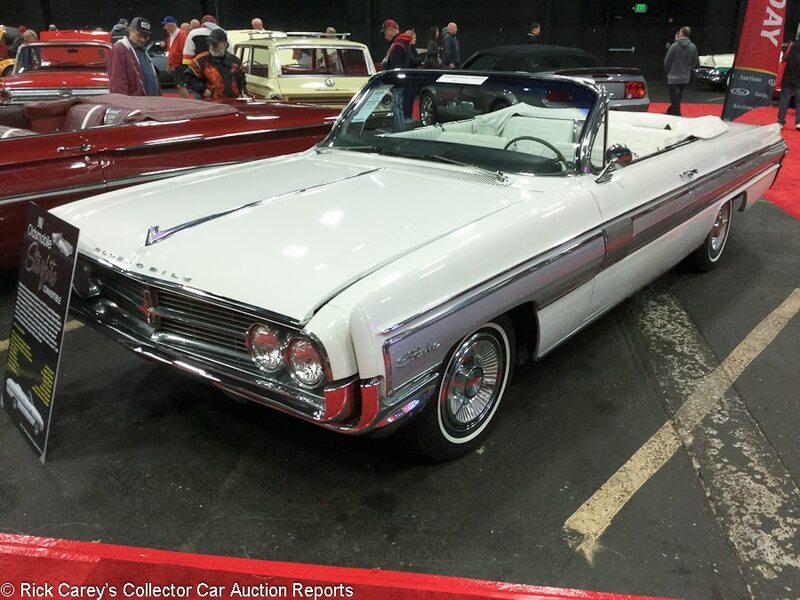 Lot # 5068 1962 Oldsmobile Starfire Convertible; S/N 626K02602; Provincial White, Sheffield Mist/White vinyl; White top; Estimate $40,000 – $60,000; Visually maintained, largely original, 3- condition; With Reserve; Hammered Sold at $25,000 plus commission of 10.00%; Final Price $27,500. – 394/345hp, automatic, power bucket seats, power windows, power steering, power brakes, console, clock and radio. – The paint has a few chips on the front of the hood with some wear as well. Some scrapes and touch ups on the trunk and right rear. The rubber seals are hard and cracked. The chrome has some slight scratches but is mostly good. The seats have moderate wear and the carpet shows minimal wear. The engine shows some dirt. The insulation on the underside of the hood has some tears, and some paint is scraped on the radiator. The underbody shows slight dirt with moderate wear. The right rear shows some signs of possible body work and the left front shows a very slight amount of early oxidation. A 20-footer that has potential if someone is willing to put in some time and effort. – A Starfire convertible offers a lot of style and performance for the money, but at this price the new owner doesn’t have much left over for the restoration costs in this car’s future. It would be worth the estimate range after restoration, not in this condition. 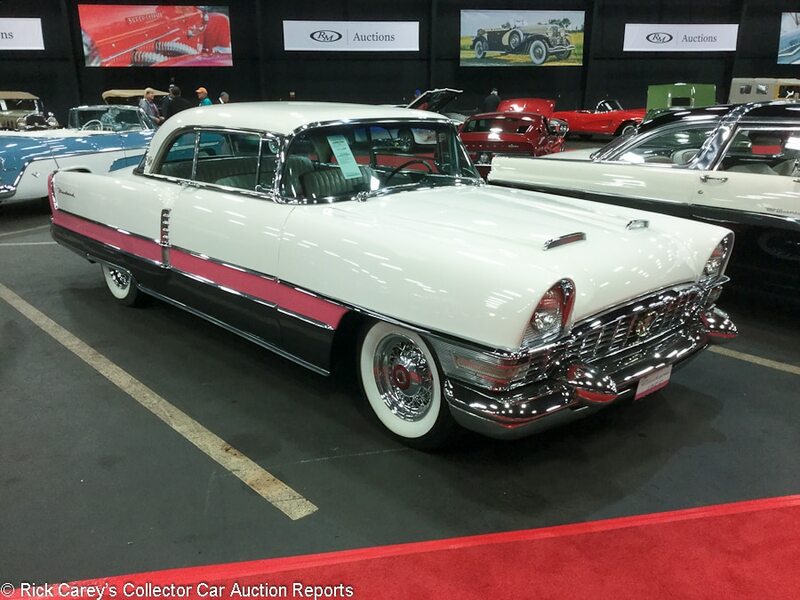 Lot # 5086 1955 Packard 400 2-Dr. Hardtop; S/N 55875576; White Jade, Gray Pearl with Rose Quartz/White with Rose Quartz leather; Estimate $24,000 – $28,000; Visually maintained, largely original, 3- condition; With Reserve; Hammered Sold at $31,000 plus commission of 10.00%; Final Price $34,100. – 352/260hp,automatic transmission, factory air conditioning, power steering, original leather interior with clock and radio, chrome wire wheels and wide whitewall tires, dual rear antennas, and fender skirts. – The paint is showing some fading and there are numerous scratches around the vehicle with a very large one on the left rear just above the tire. The rubber seals are in good condition. Both the front and rear seats are cracked and are torn. The engine is clean and detailed but has some paint missing. The underbody is clean but shows moderate wear. Represented with a recent service and never restored but has gotten major work when needed. An interesting car that has most of the appearances of a more valuable Caribbean model but is a 400. – Packard did what it could with dated designs and limited development budgets in the mid-50’s including coming up with imaginative color schemes that projected at least the appearance of style. Likely that presentation had a great deal to do with the bidders willingness to keep their paddles up until this price was realized. The condition issues are largely overlooked at this price and the seller should be extremely happy with the result. 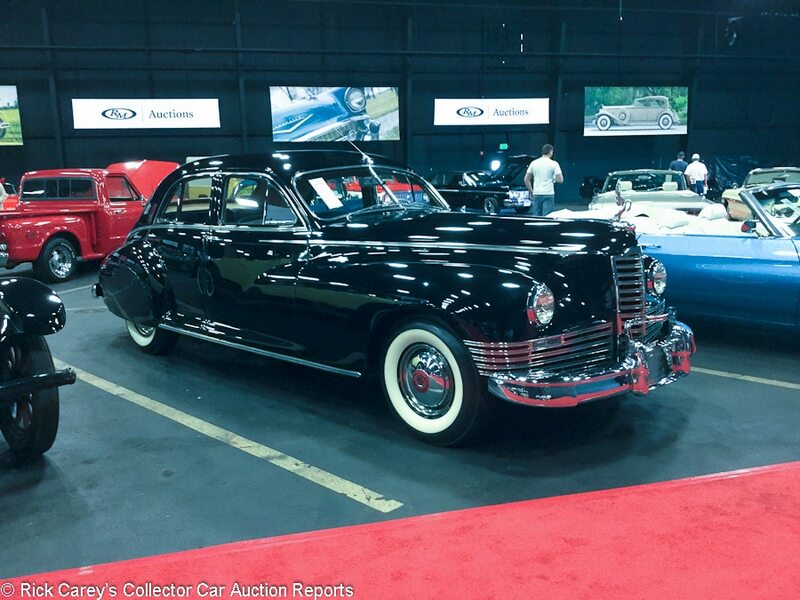 Lot # 5080 1947 Packard Custom Super Clipper Touring Sedan; S/N 21227467; Dark Blue/Blue cloth; Estimate $25,000 – $35,000; Visually maintained, largely original, 3- condition; With Reserve; Hammered Sold at $23,500 plus commission of 10.00%; Final Price $25,850. – 356/165hp, 3-speed, woodgrain dash and trim, radio and clock, fender skirts, wide whitewall tires with chrome wheel covers. – Scratches all over with a one-inch gouge on the rear driver’s side. The rubber seals are worn on the passenger side. The seats and carpet show moderate wear. The driver’s seat has some tearing on the side of the seat. The interior smells of mothballs. The engine is clean with very few signs of wear. The underbody is clean with mild wear. A good, handsome postwar Clipper but one that needs some refreshing to bring it back to its glory days. 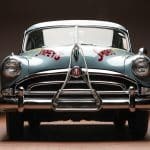 – Despite losing continuity of the senior Packards following World War II the marque maintained exclusivity with a series of luxury models with big straight eight power like this Custom Super Clipper. Its attraction shows in the bidders’ willingness to overlook the many storage and condition issues and pay this moderately generous but not excessive price for it. 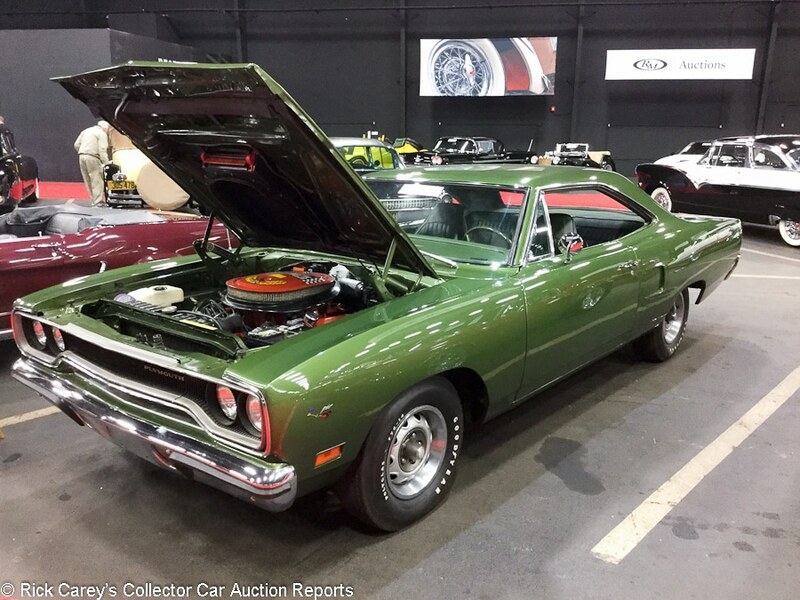 Lot # 5044 1970 Plymouth Road Runner 2-Dr. Hardtop; S/N RM23V0G214373; Rallye Green/Green vinyl; Estimate $30,000 – $50,000; Older restoration, 3+ condition; With Reserve; Hammered Sold at $41,500 plus commission of 10.00%; Final Price $45,650. – 440/390hp Six Barrel, 4-speed, pistol grip shifter, bucket seats, console, radio, Road Runner horn, Goodyear Polyglas tires. – The paint shows minor scratches on the trunk from detailing. Rubber seals are in good condition. The chrome trim shows some scratches with the front bumper having quite a few. The interior shows moderate wear and the carpet has some fading. The driver’s seat has minor tear on the left side. The underbody is clean with mild wear, however the left rear shows signs of some possible body work done. A good looking Road Runner with the 440 Six-Pack and finished in attractive colors. Restored a while ago and only showing light signs of age. – A sound and presentable car with a desirable drivetrain and an even more desirable price at least from the seller’s point of view. This is 383 money for this example’s condition. Lot # 5033 1961 Pontiac Bonneville Convertible; S/N 861K8319; Bamboo Cream/Beige, Brown, Tan; Beige top; Estimate $30,000 – $50,000; Visually maintained, largely original, 3- condition; With Reserve; Hammered Sold at $25,500 plus commission of 10.00%; Final Price $28,050. – 389/348hp Tri-Power, automatic, power convertible top, power steering, power brakes, bucket seats, column shift, wheel covers, narrow whitewalls. – The paint shows a small scratch on the trunk, and a small crack is also showing by the first “N” on the rear. The seats show moderate wear with some cracking and the carpets have mild wear. The engine is clean and detailed at the top but not in the harder to see areas. The insulation on the underside of the hood is torn. The underbody is clean but shows moderate wear and all around underneath there are early signs of oxidation. This vehicle has potential but there are signs that some work may need to be done in the future. – The Tri-Power is something of a surprise in an otherwise pretty ordinary Bonneville convertible and goes a long way to explaining why it brought this much. 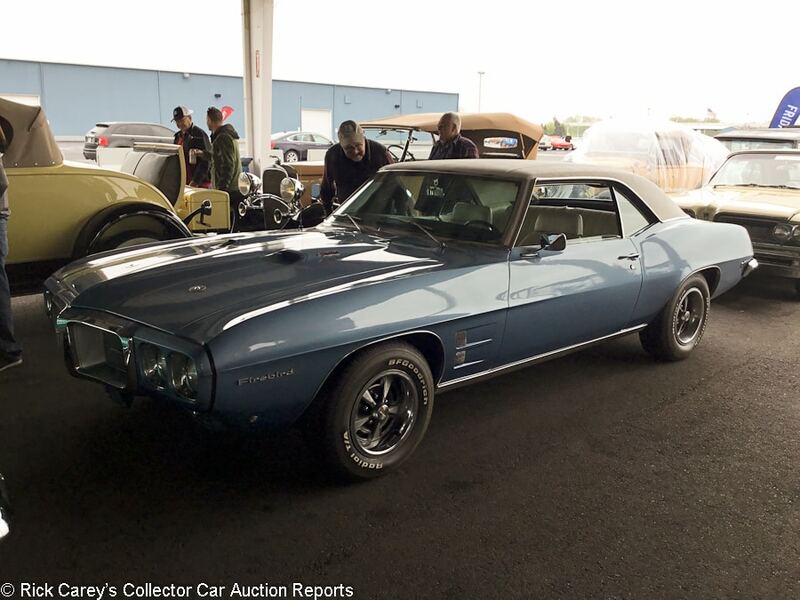 Lot # 5031 1969 Pontiac Firebird 400 2-Dr. Hardtop; S/N 223379L116357; Warwick Blue, White vinyl roof/Parchment vinyl; Estimate $28,000 – $34,000; Visually maintained, largely original, 3 condition; With Reserve; Hammered Sold at $20,000 plus commission of 10.00%; Final Price $22,000. – 400/330hp, automatic, Rally wheels, Radial T/A tires, power steering, power brakes, added air conditioning, column shift, aftermarket CD stereo. – Amateur paint that is not well finished with slight orange peel. Original vinyl top. Original interior in very good well maintained condition. The underbody is undetailed but the floors look original and are rust free. The engine bay is detailed with factory chrome valve covers. Maintained in driver condition but has never gotten any serious restoration work. – Bid to $17,000 here at Auburn Fall last September and brought a little more today, a result more representative of its quality and equipment. 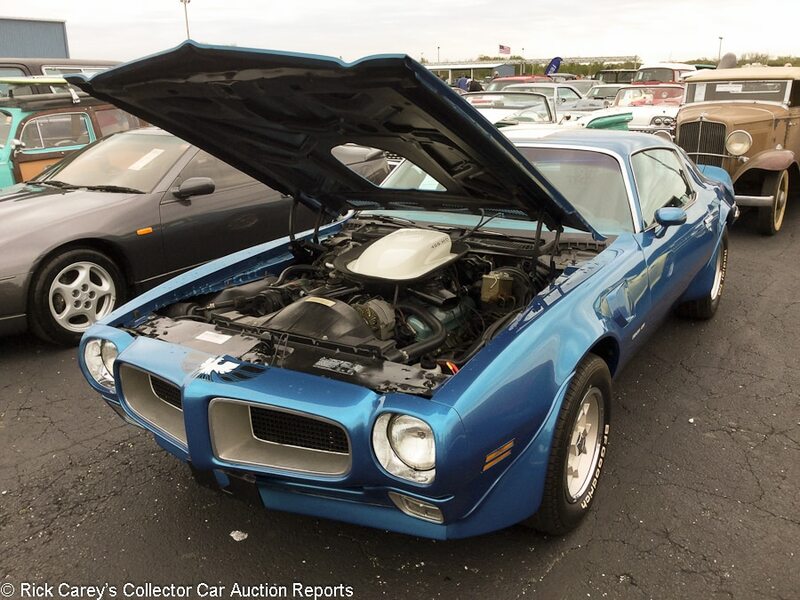 Lot # 3060 1971 Pontiac Firebird Trans Am Coupe; S/N 228871N108834; Blue, White, Black/Blue vinyl; Estimate $50,000 – $60,000; Enthusiast restoration, 3+ condition; With Reserve; Not sold at Hammer bid of $42,000. – 455/225hp HO engine, automatic, snowflake wheels, power steering, factory air conditioning. – Shiny older professional paint. Factory gaps. The interior has new carpet and upholstery, but the dash and underbody are maintained but not restored. New exhaust and shocks. Mostly restored engine bay. A car that has gotten serious work but never taken fully apart and restored. – Bid to $47,500 at Auburn Fall last September and to $47,000 at Ft Lauderdale a few weeks before. Those were numbers that really should have been taken, especially with this lower offer as a reference. 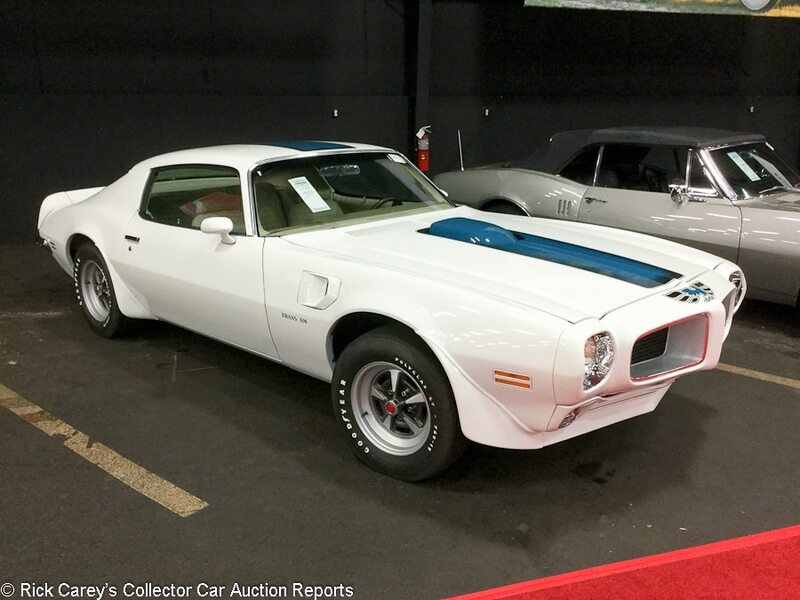 Lot # 3154 1970 Pontiac Firebird Trans Am Coupe; S/N 228870N110059; Polar White, Blue Firebird accents/Blue vinyl; Estimate $38,000 – $48,000; Older restoration, 2- condition; With Reserve; Hammered Sold at $30,750 plus commission of 10.00%; Final Price $33,825. – 400/345hp, automatic transmission with column shift, Ram Air III, power brakes, Goodyear Polyglas GT tires. – The paint has one small stone chip on the passenger’s door hinge. Rubber seals are in good condition. The carpet and seats show moderate wear. The engine is very clean and well detailed. The underbody is clean with mild wear. A good looking older restoration. – This Trans Am is better than the price it brought, aside from the rather odd column shift for the automatic transmission. 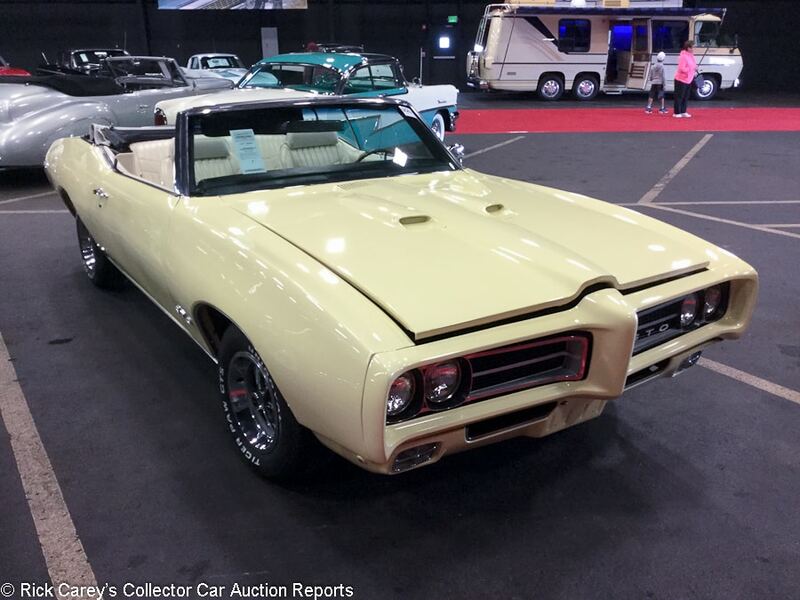 Lot # 5093 1969 Pontiac GTO Convertible; S/N 2679R139432; Mayfair Maize/Pearl White vinyl; White vinyl top; Estimate $35,000 – $40,000; Older restoration, 2- condition; With Reserve; Hammered Sold at $24,000 plus commission of 10.00%; Final Price $26,400. – Replacement engine and transmission described as a 400/350hp, automatic, PHS documentation, Uniroyal Tiger Paw GTS tires with alloy center chrome rim wheels, hood tachometer, power windows, pushbutton radio, power antenna, console. – The paint has two very small chips on the hood but is otherwise good. The rubber seals are in good condition. The seats and carpet show moderate wear. The engine is clean and detailed. The underbody is clean with mild wear. This is a good looking basic restoration that will make for a decent driver, but with the replacement powertrain it’s destined to be a driver for the rest of its life. – A lot of eyeball for the money and will probably be a very rewarding car to own. It was bought at an appealingly low price, appropriately discounted for the replacement drivetrain. 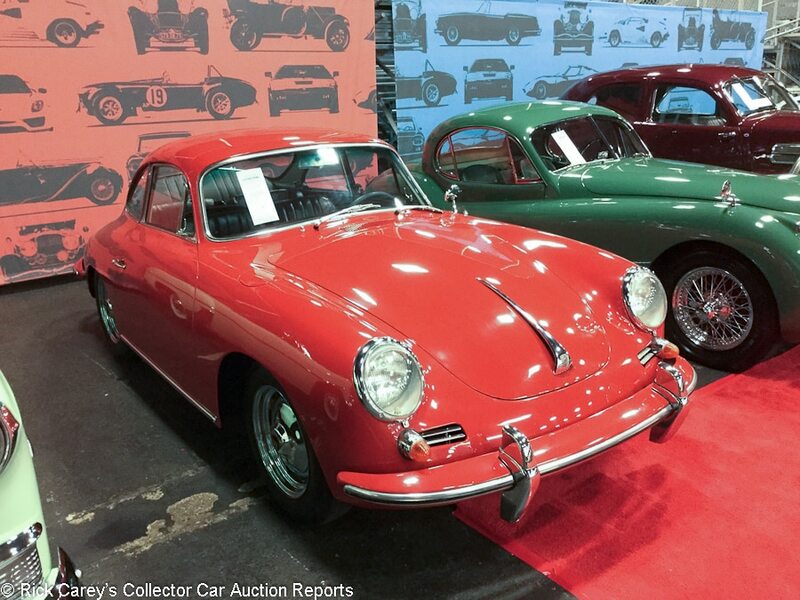 Lot # 5088 1963 Porsche 356B (T6) 1600 Super Coupe, Body by Reutter; S/N 212731; Engine # P715600; Signal Red/Black; Estimate $60,000 – $70,000; Older restoration, 3- condition; With Reserve; Hammered Sold at $49,000 plus commission of 10.00%; Final Price $53,900. – Hub caps, chrome wheels, luggage rack, VDO clock, no radio. – Reported to have $6,000 invested in brake work done in the last 6 months. There are lots of scratches and chips all over the vehicle and they have done a poor job with attempts to touch up the paint on the hood. Rubber seals are showing aging but aren’t cracked. The interior shows moderate wear. The rear window is scratched. The engine compartment is not well detailed. The underbody is dirty with a moderate amount of wear. It’s going to take a good amount of time and money to get this late 356 to anything better than driver condition, but would be a serviceable weekend cruiser as is, reward enough for its driving experience. – Reported not sold on the block at $49,000 then sold post-block for the same bid amount. It’s a fair number for an unremarkable 356B coupe with a base 60hp engine, and both parties should be perfectly happy with the result.